From rebels in ripped jeans to genteel experts on Tolstoy, this year’s crop of Russian writers in London appeals to a broad and diverse audience. 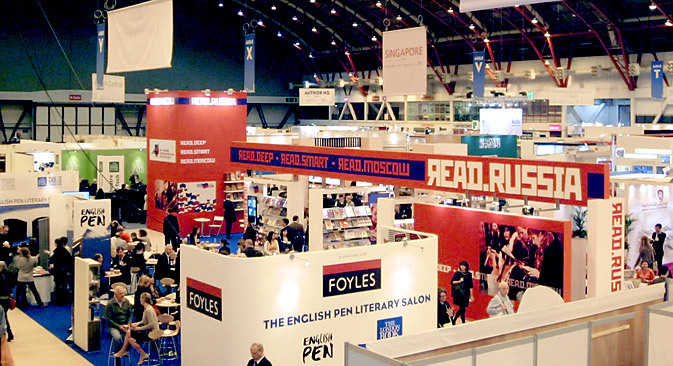 Visitors of the London Book Fair talked to RBTH about their love for Russian literature. The huge arch of Earls Court Exhibition Centre curves over the myriad stands of London’s epic-sized 2014 Book Fair. Every April, more than 25,000 book-related professionals throng here from around the world. This year, a parallel programme of events marks the Russia-UK Year of Culture. Children’s books, which recall her St. Petersburg childhood, are still favorites for Jane Bugaeva, who is visiting London from North Carolina. She easily quotes from Grigory Oster’s comic poetry for children. The poems use reverse psychology, suggesting that kids should cycle along the corridors, “crash into your dad” or run away into the freezing woods and be eaten by a bear. Has author Helen Dunmore, who spoke during the program, been influenced by Russian literature? “The simple answer is yes,” she told RBTH, “very much, especially by the Silver Age poets like Osip Mandelstam and Anna Akhmatova, but also Turgenev and Tolstoy and a whole range of writers have been a very strong influence on me.” Dunmore’s award-winning 2001 novel, “The Siege,” imagined a winter in Leningrad during the three-year siege. Often seen as Tolstoy’s heir, rabble-rouser Zakhar Prilepin has attracted a crowd. He summarized his life for the London audience: “I am 38. I have written ten books. I also work in political journalism and as a political activist.” He has been a security guard, military captain in Chechnya, and leader of a banned radical political party. Prilepin also appeared in London’s Pushkin House with Tolstoy-expert and literary critic, Pavel Basinsky. In his ripped jeans and leather jacket, Prilepin cuts a striking figure in genteel Bloomsbury.